Collaborating with an international collection of researchers, Dr. Brenda Wiederhold, Ian Miller, and Dr. Mark Wiederhold recently published a chapter in Digital Health: Scaling Healthcare to the World. 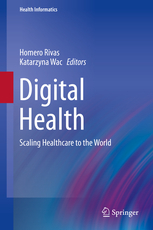 Edited by Homero Rivas and Katarzyna Wac of Stanford University, this book presents a comprehensive overview of state-of-the-art approach to digital health technologies and healthcare practices. Wiederhold, Miller, and Wiederhold contributed a chapter titled, “Augmenting Behavioral Healthcare:Mobilizing Services with Virtual Reality and Augmented Reality.” This chapter focuses on the use of virtual and augmented reality in behavioral healthcare. More specifically, it describes how these portable technologies can be used to increase access and efficiency of behavioral health interventions. For questions regarding the chapter, please contact Dr. Brenda K. Wiederhold (frontoffice@vrphobia.com). Wiederhold BK, Miller I, Wiederhold MD. Augmenting Behavioral Healthcare: Mobilizing Services with Virtual Reality and Augmented Reality. InDigital Health 2018 (pp. 123-137). Springer, Cham.